These word searches were made to be used with Kristen Foote's book How to Survive as a Shark - a fun book with awesome facts about sharks! 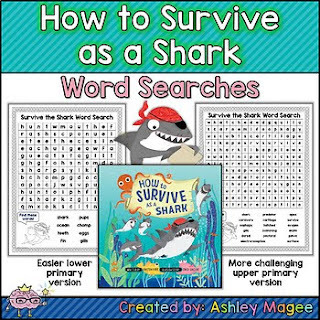 A lower primary (easier) word search is included as well as an upper primary (more challenging) word search featuring lots of great vocabulary terms. Character art is used with express written permission from Erica Salcedo and The Innovation Press.